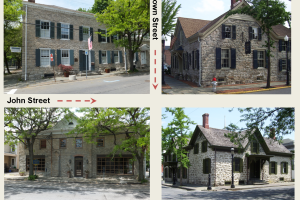 The Ulster County Clerk’s Office is pleased to announce the installation and unveiling of an Historic Marker at Kingston’s “Four Corners.” Each of the stone houses at this intersection pre-date the Revolutionary War. This historic marker was made possible through a grant from the William G. Pomeroy Foundation awarded to the Ulster County Clerk’s Office. The County Clerk’s Office was able to provide primary source documents for each stone house verifying their origins were prior to the Revolutionary War. The historic houses at this intersection are the Matthewis Persen House built in 1661, the Kingston Academy built pre-1773, the Dr. Matthew Jansen House built circa 1663, and the Franz Roggen House built pre-1767. Please join the Ulster County Clerk and the 1st Ulster Militia at the Matthewis Persen House at 10:30 am for the unveiling ceremony.